With multiple Children's Choice Awards and over 1.8 million books sold, kids, parents, and teachers agree that Babymouse is perfect for fans of Junie B. Jones, Ivy and Bean, Bad Kitty, and Dork Diaries! Meet Babymouse—Her dreams are big! Her imagination is wild! Her whiskers are ALWAYS a mess! In her mind, she's Queen of the World! In real life…she's not even Queen of the lunch table. NEW YORK TIMES bestselling, three-time Newbery Honor winning author Jennifer Holm teams up with Matthew Holm to bring you a fully illustrated graphic novel series packed with humor and kid appeal—BABYMOUSE! It's the same thing every day for Babymouse. Where is the glamour? The excitement? The fame?!? Nothing ever changes, until…Babymouse hears about Felicia Furrypaws's exclusive slumber party. Will Babymouse get invited? Will her best friend, Wilson, forgive her if she misses their monster movie marathon? 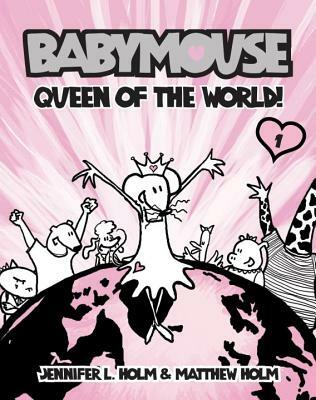 Find out in Babymouse #1: Queen of the World! All new BABYMOUSE BONUS: How to Draw Babymouse & Create-Your-Own-Comic! Brother-and-sister team MATTHEW HOLM and JENNIFER L. HOLM are the creators of the award-winning Babymouse and Squish series. Jennifer is also the author of several acclaimed novels, including three Newbery Honor winners, Our Only May Amelia, Penny from Heaven, and Turtle in Paradise. Matthew Holm is a graphic designer and freelance writer. To find out more, visit Babymouse.com.